Brown meat and add taco seasoning, following directions on packet or with seasoning recipe to make basic taco meat. If using a half pound ground beef, you might brown a whole pound and freeze the other half for an easy pasta meal the next week. Consider adding cooked lentils or kidney beans at this point and double the taco seasoning accordingly. Add all the other ingredients except the cheese and heat through on the stovetop. Be creative with the vegetables you have on hand; it’s hard to go wrong with a whole jar of salsa and some taco seasoning already in the mix! Meanwhile, use a steamer basket to steam the halved peppers for 5-10 minutes until somewhat softened but not cooked to death. 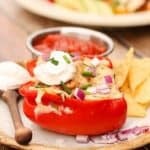 Arrange in an oval or 9×13 casserole dish and “stuff” the filling into each pepper generously. This filling is a bit like the loaves and fishes: everything is suddenly full and there’s still more left! I often end up with more filling than I need, which becomes great taco-style leftovers or freezes well for a future meal. After filling, top the peppers with shredded cheese and broil or bake at 350F for 5-10 minutes to brown the cheese. You can skip the steaming peppers step and simply fill the raw peppers, adding a little water around them in the casserole dish to soften them up while it bakes, but you’ll have to bake 30 minutes, covered, before removing the cover for 5-10 minutes to brown the cheese. You can also freeze raw peppers, simply halved, and then they’re ready for the next stuffed pepper meal, especially if you freeze a jar of leftover filling!